Research in Motion performed a neat smoke and mirrors trick when introducing the BlackBerry Torch 9800 yesterday. Instead of talking up the new phone, RIM spent most of its time walking through the BlackBerry 6 operating system. One look at the BlackBerry Torch's hardware, and you'll understand why. In a year that every high-end smartphone has opted for a 1 GHz processor, the BlackBerry Torch gets 624 MHz. I don't think this will be a major sticking point for all customers, but techies will be turned off just knowing there are faster phones on the market. RIM overhauled the interfaces for music, video, and photos in Blackberry 6, and is hyping multimedia as a major feature. So why does the Blackberry Torch come with a measly 4 GB of internal storage and 4 GB MicroSD card? Music lovers will have to invest in another MicroSD card or choose only their best albums for that beautiful new cover flow. The Blackberry Torch's 1,300 mAHr battery, which provides 5.5 hours of GSM talk time, is roughly on par with the Droid Incredible, which is to say that it's not spectacular. ix hours of talk time, and 38 hours of music playback, compared to 30 hours for the Torch. Blackberry phones won't be the best choice for road warriors if the phone can't work overtime. When the iPhone 4 and leading Android phones pack more pixels horizontally than the 360-by-480 resolution Blackberry Torch does vertically, that's a problem. When the 3.2-inch screen is dwarfed by all flagship smartphones except the too-tiny Palm Pre, that's a problem. I'm not saying RIM should've gone with a monster 4.3-inch screen -- although that would be cool -- but it could've at least aimed for the middle of the pack. I'm not terribly bothered by the Blackberry Torch's 640-by-480 video recording, but the lack of a front-facing camera for video conferencing seems like a huge missed opportunity. Also, no HDMI output? I'd think the ability to hook up with a projector for photo slides or document presentation would come in handy, but I guess RIM disagrees. Writing this article was too easy. All I had to do was look at the Blackberry Torch's major hardware specs, compare them to other leading smartphones, and note how the Torch is inferior. 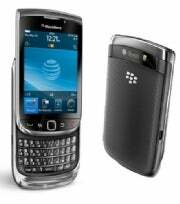 That doesn't mean the Blackberry Torch 9800 will be a bad phone, it just means RIM still has a lot more catching up to do. The Torch smartphone successfully delivers a design that is both innovative and familiar to BlackBerry users, but its performance and features aren’t quite up to par.